Welcome to week 2 of December Daily. Day 8: the day we went to see Santa at Harrods. The tag in the middle was made from two of Ali’s December Story cards and I just glued them together and punched holes. 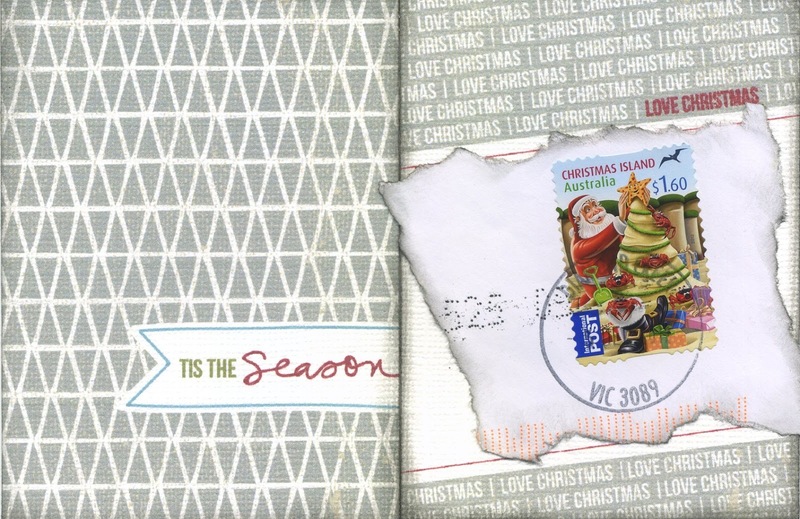 The stamp came attached to a Christmas card from the lovely Amy. Day 9: the day we went as a family to the British Military Tournament at Earl’s Court. It was a real blast from the past for me and I loved seeing The Boy Child so engrossed. He thought it was “really cool“. As you can see, it wasn’t a cheap afternoon out. Day 10: the day The Brainy One and I went to get our tree. The tree embellies were in the Studio Calico kit. In between these pages is a sheet of acetate and a chipboard page. Not sure what’s going on there yet. Day 11: the day I wrote to Santa. Yes, that’s right. I’m almost embarrassed to tell you that. I thought it important to let Santa know how his actions had made the whole experience so magical for The Boy Child. And me. I found the Santa badge lurking in a dark corner on my desk and attached it with foam pads. Day 12: the day with freezing fog and sub zero temperatures. It was also the day where The Boy Child won this term’s Singing prize and was also awarded the Lower School Star of the Week. Those small musical stars were also in the Studio Calico kit. The day when I finally posted off the last of the Christmas cards. The (second) day where I froze after school trying to see parents the PTA calendar. I like how this page looks in the album, with two photos and small journaling pages. The design will most likely reappear in the next 12 days. The advantage of Ali’s December Story cards is that they don’t have the year on them. They’ll be making appearances in the years to come. Day 13: the day where I made a second batch of Cranberry Sauce. The day with the Lower School Nativity and Whole School Carol Service. The day where the Head rang me up just after 9am to ask if I would bring my camera. (Note that he automatically knew that I would be there.) Seems the professional photographers have let him down. I think that I’ll print out another couple of templates for the 13th and add a hefty amount of journaling, as there’s a lot to say. Day 14: the first day of the school holidays. Shockingly bad weather and a Christmas DVD or two. A good afternoon to be at home. And there’s still more good stuff to come. Awesome stuff Ruth, your album looks sensational! You know I'm such a fan of mini-books, and your December daily is so wonderful, Ruth! I love that you used a postage stamp on one of your pages. I've been saving mine as they come in the mail as well.